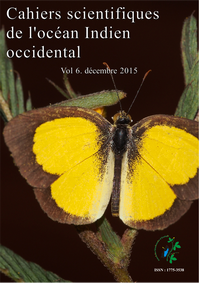 Abstract: Two new localities of the fern Haplopteris zosterifolia (Willd.) E. H. Crane (syn. Vittaria zosterifolia Willd.) were recently discovered in the Northeast of Réunion island although this species was only known from the Southeast of the island. This species is listed as Endangered on the Red List of the French IUCN Committee, and one of the new localities located along a path is seriously threatened by plant cleanings and by the presence of an invasive alien species Hiptage benghalensis (L.) Kurz. The association of H. zosterifolia and Syzygium jambos (L.) Alston let think that we deal with a novel ecosystem or a hybrid ecosystem. In order to protect this new locality and restore the habitat, the Association of the Naturalists of Bourbon draws the attention of the local authorities for a rapid action, and recommends the control of the invasive alien liana Hiptage benghalensis around the station and the replanting of native species in the purpose of increase the biodiversity. Mots clés : biodiversité, espèces exotiques invasives, espèce non cible, nouvel écosystème, écosystème hybride. Keywords: biodiversity, invasive alien species, non target species, novel ecosystem, hybrid ecosystem.